It that transitional time of the growing season where the spring weeds are coming to an end and the warm season weeds are beginning to arrive. This time of year is also when many of our warm season crops and plants are coming up too. Sometimes it isn’t easy to distinguish between a weed and a seedlings planted from seed when they are young. That’s why it is very important to learn what your garden’s weeds look like! Today we’re going to take a look at one very common, and very annoying (especially if you have allergies), weed: ragweed. 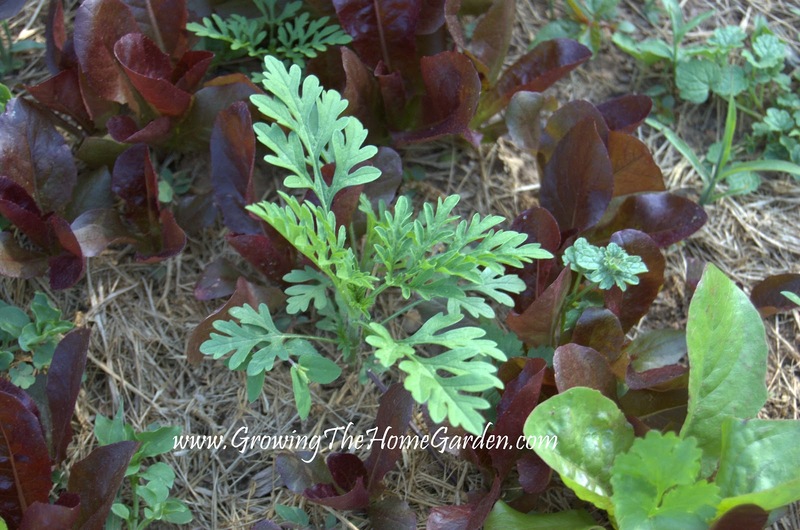 Ragweed seedling sprouting among lettuce in a raised bed. We have ragweed just about everywhere that the soil is exposed. That in itself tells me that I need to cover better with mulch! Ragweed isn’t a hard weed to remove when it’s young. It pulls up very easily. When it gets growing it can be a little more tricky to successfully remove, especially when entrenched in dry clay soil (AKA a brick). This is one of those cases where what you do (or don’t do) now could effect you later. Get the weeds when young and you’ll have fewer problems! To find more weeds in your garden look here! Thanks for this post! I've been a lurker at your blog for some time. You always have good information, but the photo of the young ragweed is extremely timely and useful to us! Informative post, thank you. As a chronic pollen hayfever sufferer I have had some summmers ruined by it so your little honey tip will come in handy for me! I pulled two of these out today. I didn't know that what they were just that they weren't suppose to be there! Thanks. Kingsnakes: A Garden’s Best Friend!